THE MOST RADICAL SPORTS TOURER WITH OUTSTANDING PERFORMANCE AND LONG-DISTANCE CAPABILITIES! 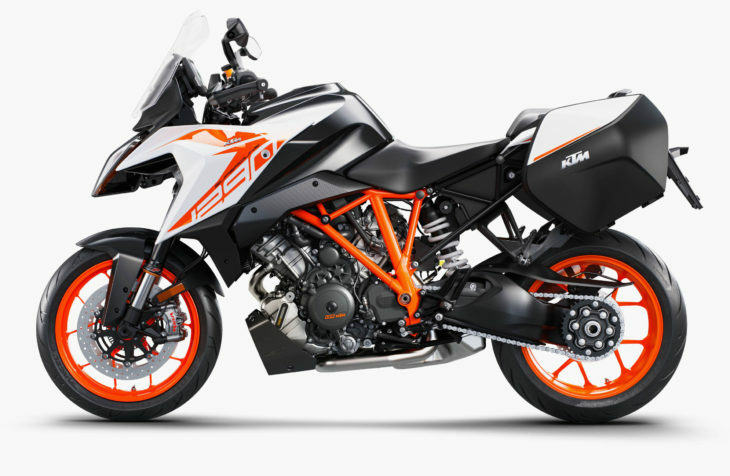 Meet the next generation of the KTM 1290 SUPER DUKE GT. At first glance, the 2019 “GT” betrays the distinct, extremely aggressive base of the 1290 SUPER DUKE R that became famous as the “Beast”. Even though it was drafted as a separate model, the GT approaches touring from a sporty angle. No ifs and buts. And just to let you know up front: the core of the SUPER DUKE GT will always be incredible performance. This KTM is the cutting-edge interpretation of a sport bike fit for travel. The 1290 SUPER DUKE GT is not a slimmed-down super tourer with racing stripes, it is an extremely sporty real-world champion, which for the first time masters the seemingly impossible split between mountainous twisties, comfortable long-distance highway travelling and breath-taking track day use, thanks to intelligent and innovative design and technology. For 2019 the 1290 SUPER DUKE GT features a new LED Headlight, Handguards, improved wind protection, a full color TFT Dashboard, a whole new shape of the front and many details like storage compartments and connectivity features. The GT’s engine also saw updates including titanium inlet valves, resonator chamber technology and new mapping, resulting in even further refinement, speed and performance. UPDATED 1,301cc LC8 V-Twin engine now with titanium valves and intake resonator chambers sets the standard in the sports tourer segment in terms of horsepower and torque. NEW 6.5” Multifunctional TFT Dashboard with KTM MY RIDE Navigation displays all important information in a clear and bright display. NEW windscreen and height adjuster offers easy adjustment and better wind and weather protection. NEW Handguards developed for perfect aerodynamic integration provide excellent rider comfort in all riding conditions. NEW LED Headlight provides optimal visibility and illumination. NEW Cruise Control design features switches on the left side of the handlebar and a display in the TFT dashboard to intuitively set and change the requested speed. UPDATED WP Semi-Active Suspension introduces a new level in comfort and performance with three settings: Comfort, Street and Sport, while the damping rates adapt in real time. Ultra-lightweight chrome-molybdenum steel trellis frame with bolt-on rear trellis subframe is light yet strong. Pirelli Angel GTs offer eager steering with a broad grip range and fantastic stability. MSC (Motorcycle Stability Control) with Cornering ABS by Bosch incl. Supermoto mode, Ride mode technology and multi-stage, lean angle sensitive Motorcycle Traction Control (MTC). Standard Quickshifter+ allows clutchless up- and downshifts under any load so the shift action is fast and smooth. KTM MY RIDE comes as standard and features a Bluetooth connection to the rider’s smart phone to control audio playback and to accept phone calls. KTM RACE ON keyless system for less hassle and increased security. Optional dealer-installed competition closed course only Track Pack with ‘Track’ ride mode which allows 3 Drive Modes, Anti-wheelie off, TC slip adjust and Launch control. Heated grips for cold riding weather comfort. Color-matched panniers with enough storage to fit most full-faced helmets. NOW I remember where I’ve seen this front end before!! It’s the giant BUG from StarTroopers! If this was much uglier there’d be a law against it. 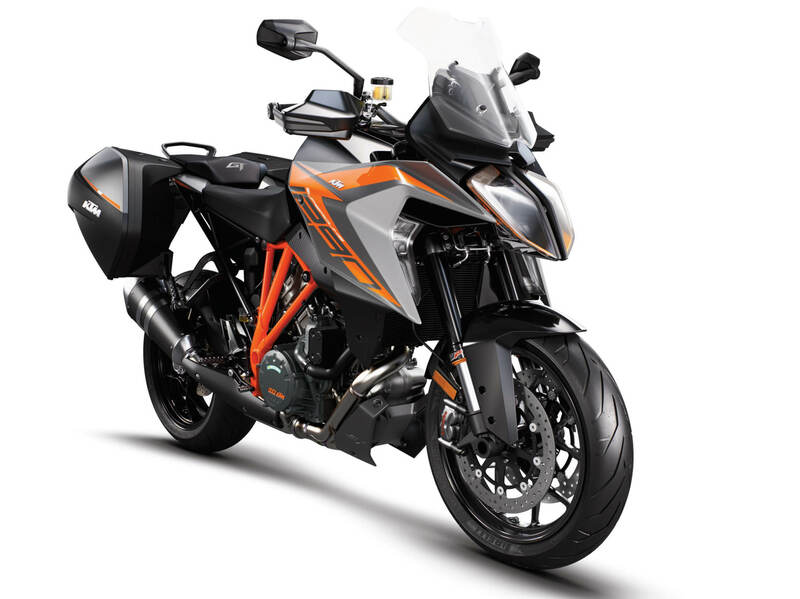 New 2019 KTM 1290 Super Duke GT Price $24,450 MSRP. I’ve got a few more years until I’m not servicing the mortgage…Now that the Motus is no more, this bike becomes the Dream Bike. The looks are strange…and not really my cup of tea….But the performance and that stance! Not a fan of lumpy vtwins…or they styling. I’m sure it’s a fantastic bike, but it hits about zero of my desire buttons. I love the idea of this sport tourer, but that has got to be the ugliest motorcycle I’ve ever seen. I agree. That front end takes the cake. I have 15K on a 2017 SDGT I seem to love it more every day. Some (?) of the beauty lies in the performance…..? The headlight/fairing assembly seems to have been inspired by Foghorn Leghorn. Despite its goofy looks, if I had mickey money I’d own one of these things. The 390 is pretty badass. What’s the valve adjustment interval? Price: I haven’t seen it announced anywhere. Valve adjustment interval: I have a 2017 Super Duke R, and this seems like the same motor (give or take some ECU settings). The valve adjustment interval for the SDR is 18,600 ml (30k km). Windshield adjustability: I just saw a youtube video of this windshield being adjusted on the motorcycle show floor. It’s vertically adjustable in nine steps. You grab the top of the windshield, push it forward, then slide it up or down. It snaps back in position (and the wind holds it from there, presumably). Pretty slick. It does help, and thank you. I was ruminating about this bike today while on a ride. I’m going to have to find one to look at. I bought a SDGT when the first bikes hit the USA. It has been an amazing super sport/touring bike in every respect. Great handling, acceleration and comfort, still trouble free and wide grin inducing. It makes me feel 10 years younger, it’s like I am 68 again! I have a Super Duke R. The first thing I thought when I rode it was, “I’m going to need another one of these, with a little wind protection”. Might be saving for a new SDGT. I “like” your post. I don’t doubt it. I would guess it’s not unlikely. Look what they do with pretty much every engine/chassis platform – maximum options. Rode one about a year ago. Loved it! It’s real easy to ride at low speed and simply awesome at higher speed. This new version is perfect. A 2 cylinder that weighs over 500 pounds with fuel… Why aren’t you guys screaming about what a heavy pig it is?lol. I’ve ridden one. With that much power on tap, and with a suspension that good, the weight simply vanishes. Heck all bikes have a lighter weight spec without fuel. I was just messing… Around here if it weighs over 400 pounds people scream..hence the comment. A 200 mph rocket ship, I stand in awe. Unfortunately, I live in a 45 mph world – I understand the importance of having reserve performance, but Jeez Louise. If I had more money than brains (I’m a little short on both, unfortunately), I’d have to own one of these, at least for the fifteen minutes it would take me to lose my license. Afterward, I’d have to get a limo, and ride in the back. If you have the self control these bikes are awesome. I am forced to resort to rain mode on occasion. Always more (friendly) power than needed in your choice of gear. Truly a pleasure to ride. This bike will not hit 200mph on a downhill with a tailwind. Or 186 for that matter. Still, faster than I’d ride it, no doubt. Other than the subjective matter of looks (it looks like a mutant bug 😉 ), well done KTM. I own a ’17 GT. I’ll be moving into a ’19 when they’re released. It is, without a doubt, the most incredible motorcycle I’ve ever owned. still,i’m sure,way too much $$$$ for me.I’ll stick to japanese reliability and price. yep, for 20 years i enjoyed three suzukis (800 and 1500 intruders, vstrom 650), and two kawasakis (1600 classic cruiser, ninja 650). no regrets whatsoever. but loyalty to the japanese bikes does not hinder me from reading about other scoots. Now if they would rid the machine of all the creases, folds, straight lines to nowhere, multiple material surfaces, open up the view of the ENGINE without all the gadgetry attached to the main reason for go, and put a flat seat with a large round lamp reflector, you would have a MOTORCYCLE. Who chee momma thats a somea go fast, like a bunny. The swing arm is smooth. I often fantasize about stripping off one of the anime manga beak bikes and doing just what you said. But, I’m sort of burned-out with custom fab work for the time being. Thank you for sharing the fantasy. I believe that the reality stop is the perimeter space frames on everything now. Functionaly much better but will never look like a 66 Triumph Bonneville. It would help if manufacturers could bring back beautiful cylinder barrels, and heads, and stop hiding ugly under BLACK everything. The heart of motorcycles is the engine, now lost forever. Just reading this press release wanted me to turn myself into the nearest lawperson for excessive hooliganism. I am the least likely person to ever want to own one of these. Hideous excess. Hideously Excessive seems to be KTM’s corporate mantra, but for those riders with enough guts and/or skill, there’s your machine. I know that it is at least a couple levels beyond MY ability, which a few years ago peaked at about 115hp for 500 pounds wet, and has since dwindled. It is now probably closer to the new 650cc Royal Enfields. I have ridden a 1290 Superduke and I own a 1090 Adventure. Newer KTM v-twins are very friendly engines with near-perfect fueling. They go only as fast as you ask them to and my 1090 will go as slow as I ask it to and not complain. That said, a 1290 SD will flatten your eyeballs…..if you ask it to. Even though this is really tempting, I’m leaning more towards the SuperAdventure. I’ve wanted one of these for a while, but would probably opt for that crazy 1290 SA R. Glad they are doing some proper updates to keep it in line with that bike. Still I would really like to see if I had the guts to flog that GT machine around corners. But yeah, I don’t need any more than 120hp which my Sprint or my last FZ1 puts out. Bummer. Keep your head up, you’ll be fine.